Independent heating – solution for main gas pipeline absence problem. Gas for country house. Home>Articles>Independent heating – solution for main gas pipeline absence problem. To provide the house with the gas is usually a headache for people. 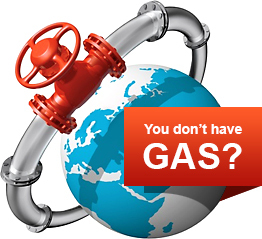 Main gas pipeline is not available everywhere. This problem is relevant even in the country with such reach natural gas resource as Russia. The objects which are situated far from main blue gas pipeline don’t have the possibility to use low-cost fuel. Expenses to lay the gas pipeline branches will not be defended: an average payback period of main gas pipeline on small area is about 18 years! The years or, even, the decades will pass while main gas pipeline will reach some corners of the country. But also then, the main pipeline gas connection will bring some additional expenses: planning work cost and gas pipeline lay cost will be added to the cost of gas cubicle meter. Moreover, land tax will be increased in 52 times after cadastre entry! Also, we can’t turn a blind eye to the trivial thievery (unauthorized connection) what will cause the pressure loss in main pipeline and, probably, boiler shutdown. Taking into account the fact that potential customers in Far East, Eastern Siberia and Far North are situated in hard-to-reach areas and quit remote from gas resources, there are new approaches and solutions are required to provide them with electrical power supply, especially those areas which are not connected to centralized electrical power supply systems (50-70% of Russian Federation territory). At the first glance, the only one alternative solution is to choose another type of fuel in spite of disadvantages in use of stove and diesel hearting. But there is better solution exists! In Western countries people use an independent heating by liquefied petroleum gas. There is a big cistern which is buried under the ground in the backyard of private house; this cistern is reinjected from time to time (depending of the volume and type of heating system) with the propane-butane mixture. And no problems! The gasification level with the liquified petroleum gas in the countryside reaches 30% in our country (99% in Amour region). Liquified petroleum gas is the main type of gas fuel in the most regions of Far East and Siberia (gasification level in some regions exceed 50%). So, the ultimate solution is to install a gasholder. Together with Italian Corporation «Antonio Merloni Cylinders Ghergo Group S.p.А.» this decision is ultrareliable, long-lasting and comfortable! 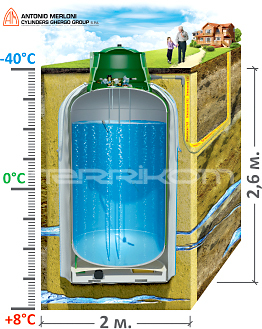 Independent gasification with liquified gas using «Antonio Merloni Cylinders Ghergo Group S.p.А.» gas tanks is the most accessible and safe alternative to the main natural gas pipeline for private house, cottage or summer house. In gas supply you should not save on the quality. Comfort in use and perfect safety! – this is the slogan of Italian Corporation «Antonio Merloni Cylinders Ghergo Group S.p.А.»; the products of this manufacturer will meet needs of the most sophisticated customer. Italian gas tanks are gaining in all technical and operating factors. «Antonio Merloni Cylinders Ghergo Group S.p.А.» offers its unique patented developments, which improve the quality and durability of the gas tanks. High quality of Italian gas tanks, comfort in their use, and wide range have made them very popular on European gas supply market.